Philippine President Gloria Macapagal-Arroyo has so far survived two attempts to oust her from office. The first attempt constituted the so-called â€œopposition salvoâ€ in July 2005. It was followed by the aborted â€œmilitary uprisingâ€ in February. The first attempt was staged by bourgeois opposition groups composed of rival electoral parties, top officials and teams who left Arroyoâ€™s executive cabinet, the Makati Business Club (a prominent capitalist group) and former president Corazon Aquino. The second attempt was staged by rebel groups within the armed forces, composed mainly of junior officers and soldiers of the elite army force. Both attempts were joined by so-called civil society groups, mainly the organised forces belonging to various militant formations. 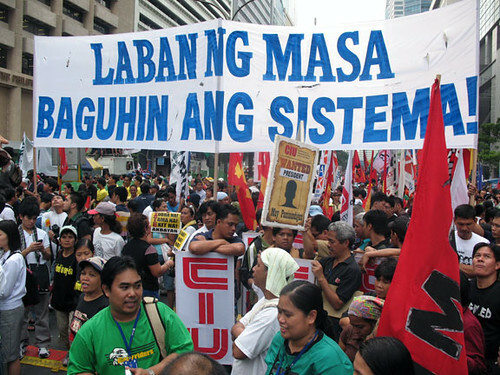 Chief among these are the forces that grouped together around Laban ng Masa,1 a newly formed coalition of the left that has persistently called for the establishment of a transitional revolutionary government as the alternative to the Arroyo regime. The transitional government (or trg as it is popularly called) is a coalition government that brings together in a transition council all the representatives of the major forces responsible for Arroyoâ€™s ouster. The trg is also a reforming government that will carry out in its 1000 days of rule a program of economic relief and political reforms aimed at reversing the tide of neo-liberal economic onslaught and dismantling the reign of elite politics in the country. On February 24, 2006, a Friday, the Philippine media reported an aborted coup d’etat allegedly launched by rebel military forces against the government of Gloria Macapagal-Arroyo. It was supposed to be headed by young officers of the Armed Forces of the Philippines (AFP) led by a former senator and colonel, Gregorio “Gringo” Honasan. He is said to command a group of junior officers and soldiers that has formed an alliance with the Communist Party of the Philippines and its armed wing, the New People’s Army. A few days later, the government announced a bounty of five million pesos for the arrest of Honasan, who had gone into hiding since that Friday. The government also released a list of more than fifty alleged co-conspirators in the coup attempt, although the prize money was reserved for Honasan, who topped the list.